One of my family’s birthday traditions is decorating a cake for the birthday person. 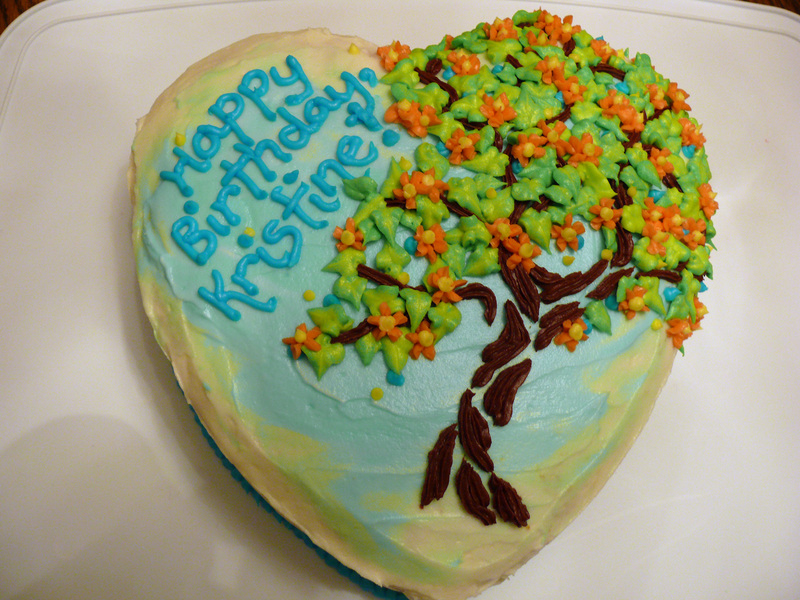 Growing up mom would let us pick out the shape and design we wanted for our cake and then she would decorate it for us. As we got older we helped her make and decorate our birthday cake. 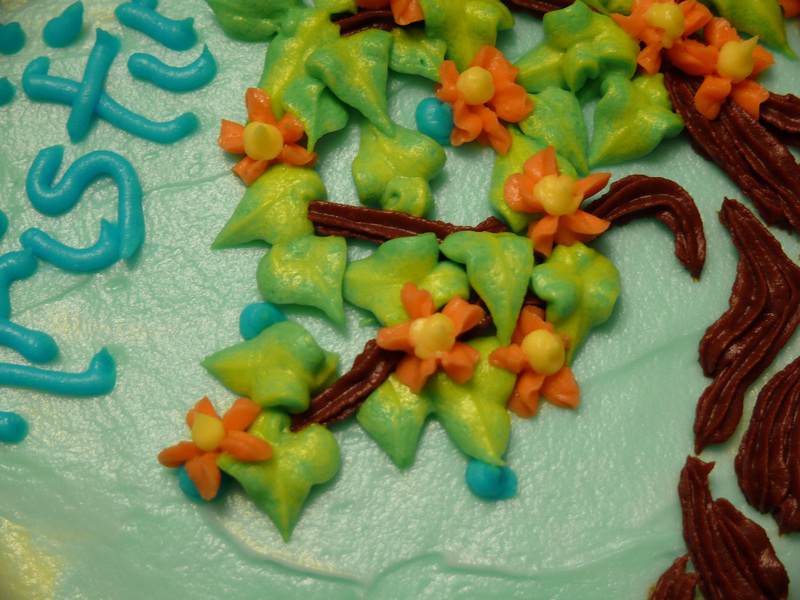 Everything I know about cake decorating I learned from my mom. 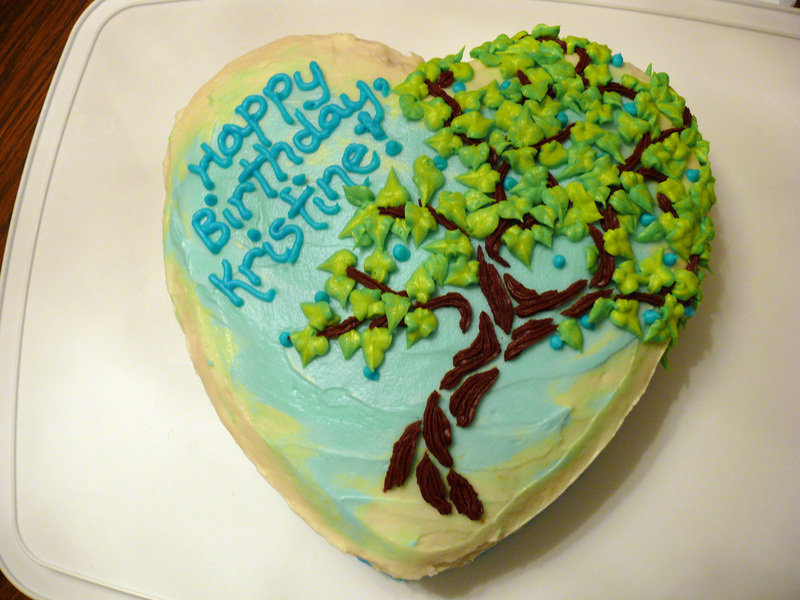 This year I made my cake by myself. 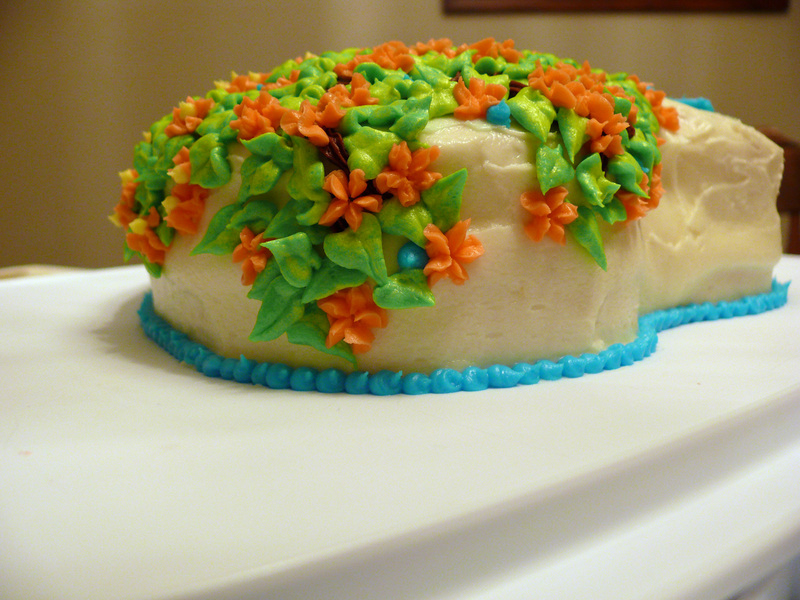 Starting out, I frosted the sides and top edges of the cake with homemade white buttercream frosting. 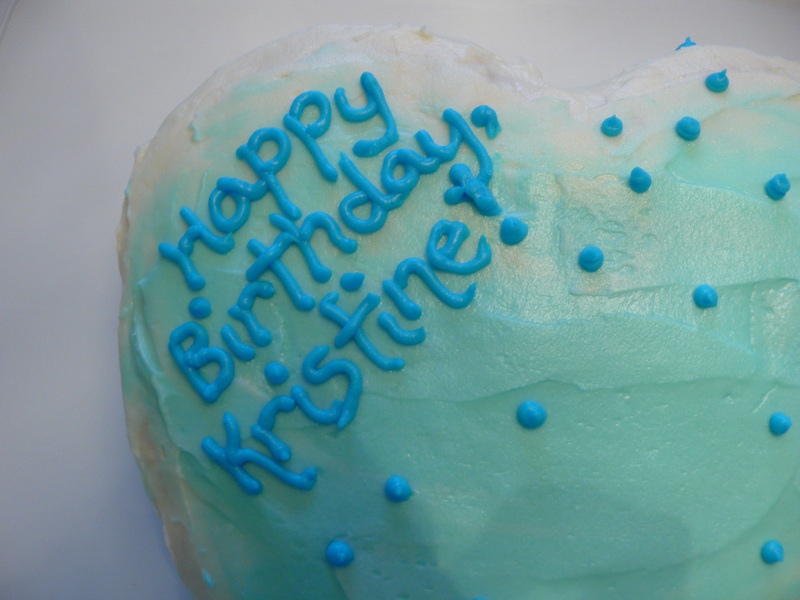 Then I colored a portion of the frosting that I’d put aside sky blue. 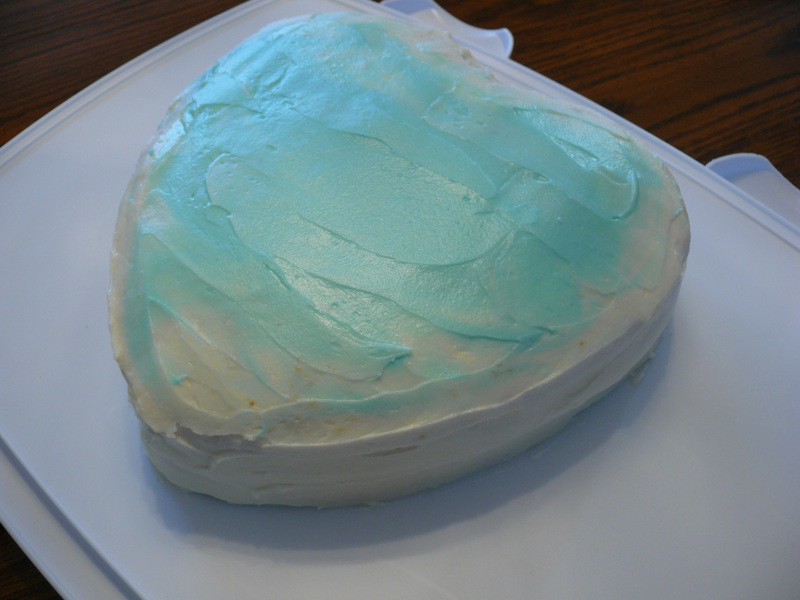 I dropped the blue frosting on top of the cake and blended it into the white frosting with a knife. I decided to do the writing next (usually my mom and I put the writing on last when we make cakes together, but I decided to put it on at this point so I’d know how much space I needed/had left over for the rest of the cake design). Piping in writing is challenging! Before I piped the writing in on the cake I practiced on a piece of parchment paper so I had an idea of how large to make the writing and what sort of letter spacing I would need. I forgot to take a picture of just the tree structure… so here ya go, two steps in one… I mixed some coco powder in to a portion of the buttercream frosting to make a rich brown frosting then used a star tip to create bark for my tree. 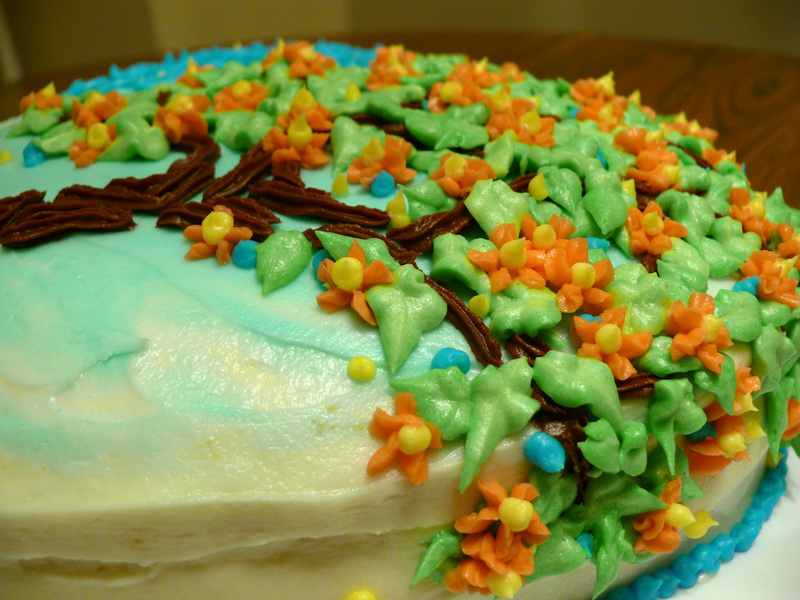 Next I put two different buttercream icing greens (one a bit more yellow-green, the other more blue-green) together in the icing bag with a leaf tip so I’d get variegated leaves. I piped on leaves wherever I thought the tree needed some leaves. I could have stopped there, but mom gave me a few new tips for my birthday so I decided to use more of them and add some flowers to the tree. Orange is my favorite color… so, orangey-peach flowers! Next I added yellow centers to the flowers. And here’s a picture of the finished cake! I am very happy with how it looks. It tasted good too!